Recognition of high rates of mental health morbidity and mortality that affect women during the perinatal period has prompted the development of psychosocial risk assessment programs. Designed to identify women, at risk, during routine health checks and delivered by primary care health service providers, these fit within a primary prevention and early intervention strategic approach to the reduction of perinatal mental illness and reflect an integrated approach to perinatal health services delivery. 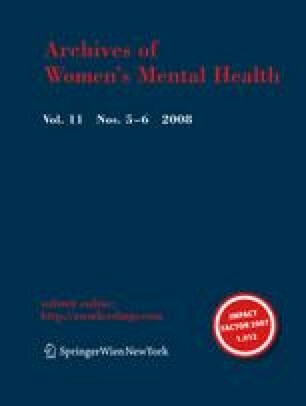 This paper describes the development and use of the psychosocial risk assessment model (PRAM) at the Royal Hospital for Women in Sydney, Australia. Data is presented on 2,142 women who attended the Antenatal Midwives Clinic between 2002 and 2005. The PRAM guides primary care staff to quickly identify women experiencing emotional distress and/or psychosocial problems during pregnancy or postnatal checks. Measures used in pregnancy are the symptom-based Edinburgh Depression Scale and the psychosocial risk-based Antenatal Risk Questionnaire. In postnatal setting the Postnatal Risk Questionnaire is used. Scores can be used to compute a Psychosocial Risk Index (PRI) to guide individualized care planning, define needs for referral and classify groups for clinical and research purposes. Based on the PRI, among 2,142 women assessed in pregnancy 70.6% were classified as low/no risk (no interventions indicated currently), 24.1% as medium risk (in need of monitoring), and 5.3% as high risk (complex). The PRAM offers a conceptual framework, methods and measures for brief psychosocial assessment with clinical and research applications. Postpartum follow up studies of women assessed during pregnancy have commenced. Randomized controlled trials and cross-cultural studies are now indicated to strengthen the evidence base for the model. This work was supported in part by funds from Beyondblue: The National Depression Initiative under the National Postnatal Depression Program—New South Wales and Royal Hospital for Women (NSW) sections 2002–2005.